A brain tumor is an abnormal growth of cells inside the brain or skull; some are benign, others malignant. Tumors can grow from the brain tissue itself (primary), or cancer from elsewhere in the body can spread to the brain (metastasis). Treatment options vary depending on the tumor type, size and location. Treatment goals may be curative or focus on relieving symptoms. Many of the 120 types of brain tumors can be successfully treated. New therapies are improving the life span and quality of life for many people. Normal cells grow in a controlled manner as new cells replace old or damaged ones. For reasons not fully understood, tumor cells reproduce uncontrollably. A primary brain tumor is an abnormal growth that starts in the brain and usually does not spread to other parts of the body. Primary brain tumors may be benign or malignant. A benign brain tumor grows slowly, has distinct boundaries, and rarely spreads. Although its cells are not malignant, benign tumors can be life threatening if located in a vital area. A malignant brain tumor grows quickly, has irregular boundaries, and spreads to nearby brain areas. Although they are often called brain cancer, malignant brain tumors do not fit the definition of cancer because they do not spread to organs outside the brain and spine. Metastatic (secondary) brain tumors begin as cancer elsewhere in the body and spread to the brain. They form when cancer cells are carried in the blood stream. The most common cancers that spread to the brain are lung and breast. Whether a brain tumor is benign, malignant, or metastatic, all are potentially life-threatening. Enclosed within the bony skull, the brain cannot expand to make room for a growing mass. As a result, the tumor compresses and displaces normal brain tissue. Some brain tumors cause a blockage of cerebrospinal fluid (CSF) that flows around and through the brain. This blockage increases intracranial pressure and can enlarge the ventricles (hydrocephalus). Some brain tumors cause swelling (edema). Size, pressure, and swelling all create "mass effect," which cause many of the symptoms (Fig. 1). Figure 1. Brain tumors may grow from nerves (neuroma), dura (meningioma), or pituitary gland (craniopharyngioma or pituitary adenoma). They may also grow from the brain tissue itself (glioma). As they grow they may compress normal tissue and cause symptoms. The World Health Organization (WHO) developed a classification and grading system to standardize communication, treatment planning, and predict outcomes for brain tumors. Tumors are classified by their cell type and grade by viewing the cells, usually taken during a biopsy, under a microscope. Cell type. Refers to the cell of origin of the tumor. For example, nerve cells (neurons) and support cells (glial and schwann cells) give rise to tumors. About half of all primary brain tumors grow from glial cells (gliomas). There are many types of gliomas because there are different kinds of glial cells. Grade. Refers to the way tumor cells look under the microscope and is an indication of aggressiveness (e.g., low grade means least aggressive and high grade means most aggressive) (Table 1). Tumors often have a mix of cell grades and can change as they grow. Differentiated and anaplastic are terms used to describe how similar or abnormal the tumor cells appear compared to normal cells. Figure 2. Brain tumor symptoms are related to the functional areas of the brain in which they are located. 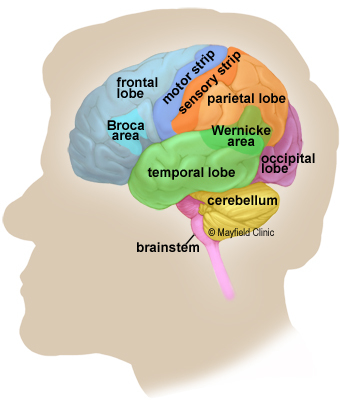 Frontal lobe tumors may cause: behavioral and emotional changes; impaired judgment, motivation or inhibition; impaired sense of smell or vision loss; paralysis on one side of the body; reduced mental abilities and memory loss. Parietal lobe tumors may cause: impaired speech; problems writing, drawing or naming; lack of recognition; spatial disorders and eye-hand coordination. Brainstem tumors may cause: behavioral and emotional changes, difficulty speaking and swallowing, drowsiness, hearing loss, muscle weakness on one side of the face (e.g., head tilt, crooked smile), muscle weakness on one side of the body, uncoordinated gait, drooping eyelid or double vision, and vomiting. Pituitary gland tumors may cause: increased secretion of hormones (Cushing’s Disease, acromegaly), a stop in menstruation, abnormal secretion of milk, and decreased libido. The American Brain Tumor Association estimates that about 80,000 people will be diagnosed with a primary brain tumor in the US this year. Metastatic (secondary) brain tumors are five times more common than primary brain tumors and they occur in 10% to 30% of cancer patients. People are surviving cancer longer than ever before. As a result, metastatic brain tumors will likely increase in the years to come. Although brain tumors can occur at any age, they are most common in children 3 to 12 years old and in adults 40 to 70 years old. Audiometry, a hearing test performed by an audiologist, detects hearing loss due to tumors near the cochlear nerve (e.g., acoustic neuroma). An endocrine evaluation measures hormone levels in your blood or urine to detect abnormal levels caused by pituitary tumors (e.g., Cushing’s Disease). A visual field acuity test is performed by a neuro-ophthalmologist to detect vision loss and missing areas in your field of view. A lumbar puncture (spinal tap) may be performed to examine cerebrospinal fluid for tumor cells, proteins, infection, and blood. Computed Tomography (CT) scan uses an X-ray beam and a computer to view anatomical structures. It views the brain in slices, layer-by-layer, taking a picture of each slice. A dye (contrast agent) may be injected into your bloodstream. CT is very useful for viewing changes in bony structures. Magnetic Resonance Imaging (MRI) scan uses a magnetic field and radiofrequency waves to give a detailed view of the soft tissues of the brain. It views the brain 3-dimensionally in slices that can be taken from the side or from the top as a cross-section. A dye (contrast agent) may be injected into your bloodstream. MRI is very useful to evaluate brain lesions and their effects on surrounding brain (Fig. 3). Figure 3. 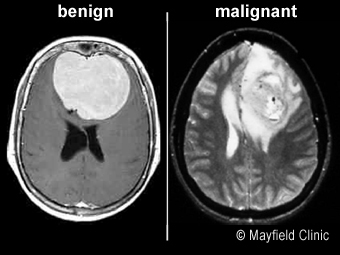 MRI scans of a benign and malignant brain tumor. Benign tumors have well defined edges and are more easily removed surgically. Malignant tumors have an irregular border that invades normal tissue with finger-like projections making surgical removal more difficult. If a diagnosis cannot be made clearly from the scans, a biopsy may be performed to determine what type of tumor is present. Biopsy is a procedure to remove a small amount of tumor cells to be examined by a pathologist under a microscope. A biopsy can be taken as part of an open surgical procedure to remove the tumor or as a separate diagnostic procedure, known as a needle biopsy. A small burr hole is drilled in the skull so that a hollow needle can be guided into the tumor and a tissue sample removed (Fig. 4). A stereotactic frame and a computer are often used to help precisely locate the tumor and direct the needle to deep tumors in critical locations. Biomarkers or genetic mutations found in the tumor may help determine prognosis. These include: IDH1, IDH2, MGMT, and 1p/19q co-deletion. Figure 4. During a needle biopsy, a hollow cannula is inserted into the tumor. Small biting instruments remove bits of tumor for the pathologist to examine and determine the exact tumor cell type. Because there are so many kinds of brain tumors and some are complex to treat, many doctors may be involved in your care. Your team may include a neurosurgeon, oncologist, radiation oncologist, radiologist, neurologist, and neuro-ophthalmologist. Treatment options vary depending on the type, grade, size and location of the tumor; whether it has spread; and your age and general health. The goal of treatment may be curative or focus on relieving symptoms (palliative care). Treatments are often used in combination with one another. The goal is to remove all or as much of the tumor as possible through surgery to minimize the chance of recurrence. Radiation therapy and chemotherapy are used to treat tumors that cannot be removed by surgery alone. For example, surgery may remove the bulk of the tumor and a small amount of residual tumor near a critical structure can later be treated with radiation. Sometimes the best treatment is observation. For example, benign, slow growing tumors that are small and have few symptoms may be observed with routine MRI scans every year until their growth or symptoms necessitate surgery. Observation may be the best option for people who are older or with other health conditions. Medications are used to control some of the common side effects of brain tumors. Steroids, such as dexamethasone (Decadron), are used to reduce swelling and fluid build-up (edema) around the tumor. Because steroids can cause stomach ulcers and gastric reflux, famotidine (Pepcid) or pantoprazole (Protonix) are prescribed to reduce the amount of acid produced in the stomach. Furosemide (Lasix) or mannitol (Osmitrol) may be used to control edema and swelling. Anticonvulsants are used to prevent or control seizures. The most common ones include phenytoin (Dilantin), valproic acid (Depakote), carbamazepine (Tegretol), and levetiracetam (Keppra). Surgery is the treatment of choice for brain tumors that can be reached without causing major injury to vital parts of the brain. Surgery can help to refine the diagnosis, remove as much of the tumor as possible, and release pressure within the skull. 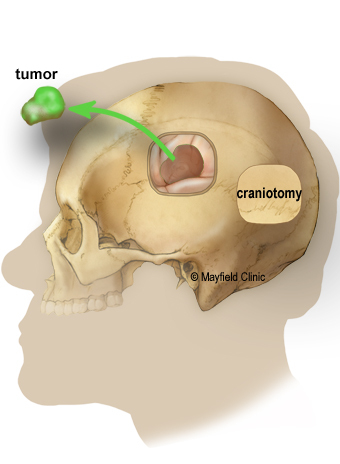 A neurosurgeon performs a craniotomy to open the skull and remove the tumor (Fig 5). Sometimes only part of the tumor is removed if it is near critical areas of the brain. A partial removal can still relieve symptoms. Radiation or chemotherapy may be used on the remaining tumor cells. Image-guided surgery technologies, tumor fluorescence, intraoperative MRI/CT, and functional brain mapping have improved the surgeon’s ability to precisely locate the tumor, define the tumor’s borders, avoid injury to vital brain areas, and confirm the amount of tumor removal while in the operating room. Figure 5. Surgery involves cutting a window in the skull (craniotomy) to remove the tumor. Laser ablation is a minimally invasive treatment that transmits heat to “cook” brain tumors from the inside out. 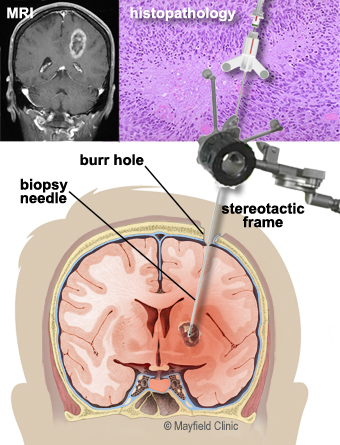 A probe is inserted to the tumor through a burr hole in the skull. The laser catheter is guided with real-time MRI. 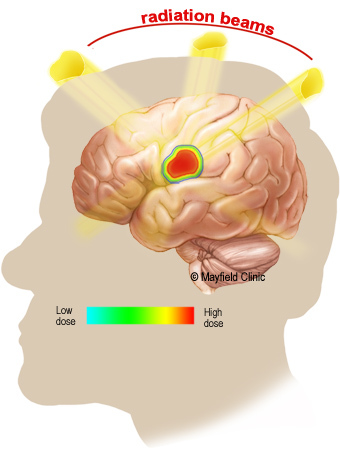 Radiation therapy uses controlled high-energy rays to treat brain tumors. Radiation damages the DNA inside cells, making them unable to divide and grow. The benefits of radiation are not immediate but occur with time. Aggressive tumors, whose cells divide rapidly, tend to respond quickly to radiation. Over time, the abnormal cells die and the tumor may shrink. Benign tumors, whose cells divide slowly, may take months to show an effect. Pinpoint accuracy is critical so that the lethal dose is applied only to the tumor and not to surrounding healthy tissues. There are two ways to deliver radiation, external and internal beams. External beam radiation is delivered from outside the body by a machine that aims high-energy rays (x-rays, gamma rays) at the tumor (Fig. 6). Figure 6. A machine rotates around the patient, aiming radiation beams at the tumor. The radiation beams are shaped to match the tumor and minimize exposure to normal brain tissue. Stereotactic radiosurgery (SRS) delivers a high dose of radiation during a single session. Frames and masks are used to keep the patient immobile. Fractionated radiotherapy delivers lower doses of radiation over many visits. Patients return daily over several weeks to receive the complete radiation dose. Whole brain radiotherapy (WBRT) delivers the radiation dose to the entire brain. It may be used to treat multiple brain tumors and metastases. Internal radiation (brachytherapy) is delivered from inside the body by radioactive seeds surgically placed inside the tumor. After the patient undergoes a craniotomy to remove the tumor, the radioactive implants are placed inside the empty tumor cavity. The radiation dose is delivered to the first few millimeters of tissue in the cavity where malignant cells may still remain. Patients have no risk of radiation injury to other parts of their own body or to others around them because the dose is short lived. Chemotherapy drugs work by disrupting cell division. Over time, chemotherapy causes the abnormal cells to die and the tumor may shrink. This treatment can also damage normal cells, but they can repair themselves better than abnormal cells. Treatment is delivered in cycles with rest periods in between to allow the body to rebuild healthy cells. Chemotherapy drugs can be taken orally as a pill, intravenously (IV), or as a wafer placed surgically into the tumor. The drugs most commonly used to treat brain tumors are temozolomide (Temodar) and bevacizumab (Avastin). The most common side effects are nausea, low blood counts, infections, fatigue, constipation, and headaches. Chemotherapy is also used to increase tumor cell death during radiation therapy. Some chemotherapy drugs (BCNU wafer) are applied locally to the tumor bed after the tumor has been removed. By applying it directly to the diseased area of the brain, side effects are limited and the drug has a more beneficial effect. Chemotherapy is typically used for high-grade gliomas; it is not routinely used for benign tumors. Figure 7. Chemotherapy for high-grade gliomas is usually taken as a pill daily for a set period of time called a cycle. The drug circulates through the bloodstream to the brain where it crosses the blood-brain-barrier to the tumor. Immunotherapy or biotherapy activates the immune system (T-cells and antibodies) to destroy tumor cells. Research is exploring ways to prevent or treat cancer through vaccines. Gene therapy uses viruses or other vectors to introduce new genetic material into tumor cells. This experimental therapy can cause tumor cells to die or increase their susceptibility to other cancer therapies. Hyperbaric oxygen uses oxygen at higher than normal levels to promote wound healing and help fight infection. It may also improve the tumor’s responsiveness to radiation and is being studied experimentally. Currently it is being used to help the body naturally remove dead tumor cells and treat radiation necrosis. TTFields slows and reverses tumor growth by keeping cells from dividing. TTFields is used for the treatment of glioblastoma multiforme (GBM) in combination with temozolomide in adults who have been newly diagnosed. It is also approved for treatment of recurrent GBM after surgical and radiation options have been exhausted. Treatment involves wearing a device resembling a bathing cap that delivers electromagnetic energy to the scalp. Your primary care doctor and oncologist should discuss any home care needs with you and your family. Supportive measures vary according to your symptoms. For example, canes or walkers can help those having trouble walking. A plan of care to address changes in mental status should be adapted to each patient’s needs. Driving privileges may be suspended while taking anti-seizure medication. As each state has different rules about driving and seizures, discuss this issue with your doctor. It may also be appropriate to discuss advance medical directives (e.g., living will, health care proxy, durable power of attorney) with your family to ensure your medical care and wishes are followed. Because brain tumors develop in parts of the brain that control movement, speech, vision and thinking, rehabilitation may be a necessary part of recovery. Although the brain can sometimes heal itself after the trauma of treatment, it will take time and patience. A neuropsychologist can help patients evaluate changes caused by their brain tumor and develop a plan for rehabilitation. A neuropsychological evaluation assesses the patient's emotional state, daily behavior, cognitive (mental) abilities, and personality. Physical therapy, occupational therapy, and speech therapy may be helpful to improve or correct lost functions. How well a tumor will respond to treatment, remain in remission, or recur after treatment depends on the specific tumor type and location. A recurrent tumor may be a tumor that still persists after treatment, one that grows back some time after treatment destroyed it, or a new tumor that grows in the same place as the original one. When a brain tumor is in remission, the tumor cells have stopped growing or multiplying. Periods of remission vary. In general, benign tumors recur less often than malignant ones. Since it is impossible to predict whether or when a particular tumor may recur, lifelong monitoring with MRI or CT scans is essential for people treated for a brain tumor, even a benign lesion. Follow-up scans may be performed every 3 to 6 months or annually, depending on the type of tumor you had. Support groups provide an opportunity for patients and their families to share experiences, receive support, and learn about advances in treatments and medications. anaplastic: when cells divide rapidly and bear little or no resemblance to normal cells in appearance or function. astrocytoma: a tumor arising in the supportive cells (astrocytes) of the brain or spinal cord; most often in the cerebrum. benign: does not invade nearby tissues or spread; noncancerous. biopsy: a sample of tissue cells for examination under a microscope to determine the existence or cause of a disease. brachytherapy: a type of radiation therapy where capsules containing radioactive substances are surgically implanted into the tumor to deliver radiation; also called internal radiotherapy. cancer: generic term for more than 100 different diseases caused by uncontrolled, abnormal growth of cells. Cancer cells can invade and destroy normal tissue, and can travel through the bloodstream and lymphatic system to reach other parts of the body. chemotherapy: treatment with toxic chemicals (e.g., anticancer drugs). chondrosarcoma: a rare, malignant bone tumor arising from primitive notochord cells and composed of cartilage. chordoma: a rare, bone tumor arising from primitive notochord cells; usually occurs at the base of the spine (sacrum) or at the skull base (clivus). craniopharyngioma: a benign tumor arising from cells located near the pituitary stalk. differentiation: refers to how developed cancer cells are in a tumor. Well-differentiated tumor cells resemble normal cells and tend to grow and spread at a slower rate than undifferentiated, which lack the structure and function of normal cells and grow uncontrollably. edema: tissue swelling caused by the accumulation of fluid. ependymoma: a tumor arising from the ependyma cells lining the ventricles of the brain and central canal of the spinal cord. epidermoid: a benign, congenital tumor arising from ectodermal cells; also called pearly tumor. glioma: any tumor arising from glial tissue of the brain, which provides energy, nutrients, and other support for nerve cells in the brain. immunotherapy: treatment designed to improve or restore the immune system’s ability to fight infection and disease. intracranial pressure (ICP): pressure within the skull. Normal ICP is 20 mm HG. lesion: a general term that refers to any change in tissue, such as tumor, blood, malformation, infection, or scar tissue. lymphoma: a rare tumor arising from lymph cells; may metastasize to the brain from lymphoma tumor elsewhere in the body. malignant: having the properties of invasive growth and ability to spread to other areas. mass effect: damage to the brain due to the bulk of a tumor, the blockage of fluid, and/or excess accumulation of fluid within the skull. medulloblastoma: a tumor arising from primitive nerve cells; most often in the cerebellum. 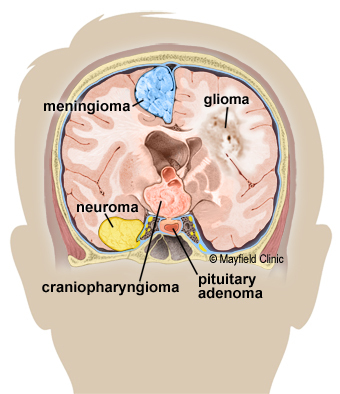 meningioma: a tumor arising from the meninges, the membrane that surrounds the brain and spinal cord. metastasis: the spreading of malignant cells. metastatic: cancerous tumor that has spread from its original source through the blood or lymph systems. oligodendroglioma: a tumor arising from the support cells (oligodendroglia) that produce myelin, the fatty covering around nerve cells. pituitary adenoma: a tumor arising from cells in the pituitary gland; tumor may be hormone-secreting (prolactin, adrenocorticotropic, growth hormone) or not. radiation: high-energy rays or particle streams used to treat disease. schwannoma (also called neuroma): a tumor arising from Schwann cells that produce myelin. tumor: an abnormal growth of tissue resulting from uncontrolled multiplication of cells and serving no physiological function; can be benign or malignant. Image-guided systems enable us to navigate precisely in remote areas and to remove tumors with minimum impact to our patients. Intraoperative diagnostics, including the Mayfield MobileSCAN CT, give up-to-date images of an operation and help surgeons confirm that every bit of tumor has been removed. Radiation technologies like Gamma Knife allow us to eradicate some tumors without making any incision at all.